Altadena Filming: Cost of a film permit in Altadena. Is it cheap? Cost of a film permit in Altadena. Is it cheap? Ever wonder what a filming permit cost in Altadena? I began to wonder when, with a little help, I came across this filming permit for a 2-day film shoot that took place about a year ago. What are "road use fees," "permit rider fees" and "road encroachment fees" anyway? They are nearly as mysterious as those bizarre charges on our phone bills. (Can anyone out there explain the "Broadcast TV Surcharge" or the "Regulatory Video Cost Recovery Charge?") 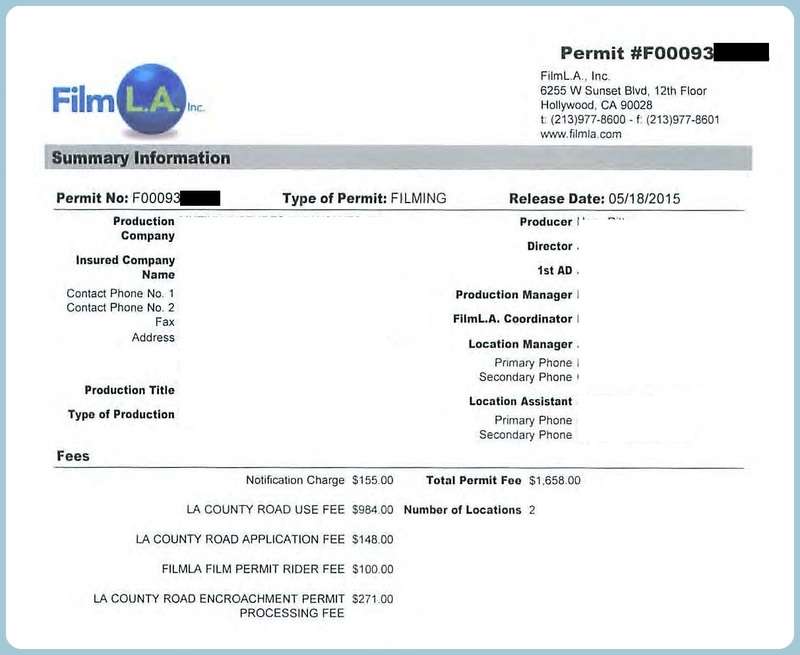 And what about the FilmLA's tried-and-true $650 "permit application fee?" How's that fit into the bargain? Is that an upper on the the tidy sum of $1,658? Did this company have fork over $2,300 in permit fees? Regrettably, I don't know. Side note: Pity the poor Location Manager or production person who must fill out the film permit application. It is a job that could only bring joy to your inner bureaucrat. If by some remote chance you are lucky enough to have never seen one, here's your chance. Just click on this link to the FilmLA filming permit application. No doubt due to some personality defect, I wanted to know what all those charges meant. Last week I contacted our FilmLA contact, Arturo Pina and our LACO supervisor representative asking for information about these fees. Arturo responded that he didn't know but that the FilmLA operations manager who was "expert in these things" will get back to me." (A familiar refrain) I also asked a Location Manager. He didn't know. For the moment, these charges remain a mystery. Meanwhile, I got curious about how our unincorporated LA County filming fees might compare to fees in other jurisdictions in LA County. Surely it must be cheaper in Altadena... Right? Being a belt and suspenders type, I spent 20 rigorous minutes of web surfing and discovered some permit fee rates for a few nearby local governments; governments who run their own film permitting operations. The following table is a highly unofficial summary of some filming permit fees in our general area. Note: if you happen to be someone who can't read blurry microscopic type, you can get a bigger view by mousing over the document frame and clicking on the box with the arrow in the upper right-hand corner. FilmLA/Altadena and Pasadena have the most expensive filming permits. La Canada has the cheapest. Santa Clarita and Burbank seem pretty cheap too. The FilmLA Monitor is an extra charge. It's hard to tell, but La Canada, Arcadia, and Burbank don't offer Monitors. Police rates are consistent across all jurisdictions. However the CHP get the bigger check. Closing a street is, by comparison, affordable in Altadena and Santa Clarity. It gets expensive in Pasadena. So is it really cheaper here in Altadena? One thing's for sure, it's not the cheapest. Film companies must like our community for other reasons. Go figure?! However, since daily shooting costs remain roughly constant no matter where you shoot as are the variable costs are filming and travel, then maybe film permitting costs are more of an annoyance than a driving factor. I don't mean to cavalier other people's money, but would $2,000 be a major determinant in the decision to shoot your $100 - 500K+ TV episode in Altadena instead of Santa Clarita? That's a topic for another day. Hi Kenny, I wanted to shoot some videos at the park of either Altadena or Pasadena. Do you happen to know the contact number or email to start the application process or to ask questions? It's my understanding FilmLA is very supportive and will walk you through. Also, you can apply online. I wouldn't hesitate to give them a call (213- 977-8600) or email (info@filmla.com). Filming permits for Pasadena are handled by a different agency -- the Film Office in Economic Development Office. Pasadena isn't a focus here, so we don't have much info. However, here's a link to their web page which should provide a good start.